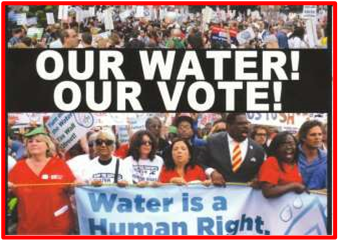 HomeWaterReferendum Campaign: Our Water, Our Vote! Blow the Great Lakes Water Authority Out of the Water! On June 12, 2015, the “City of Detroit” signed a contract with “The Great Lakes Water Authority.” It “leases” the nation’s third largest public municipal water and sewerage department, (DWSD) to an unelected regional authority imposed by Detroit’s unelected former Emergency Manager under the unconstitutional Detroit Bankruptcy plan. But all is not lost. THE CONTRACT ALLOWS DETROITERS TO HOLD A REFERENDUM VOTE ON IT, under PA 233 of 1955. A total of 15,000 petition signatures must be submitted. PETITION CIRCULATORS DO NOT HAVE TO BE RESIDENTS OF DETROIT. Join the Petition Campaign to Stop This Disaster for Detroit and the Counties of Wayne, Oakland, Macomb, St. Clair, Lapeer, Genesee, Washtenaw and Monroe. BILL OF SALE: The 333-page contract is NOT a lease. It repeatedly says it a “Bill of Sale” from the City conveying all its “right, title and interest” in DWSD personal property and every cent of its $6 billion in revenues, including retail revenues from Detroiters, to the GLWA. PRIVATIZATION: The Authority can also sell real property as it chooses, leaving the way open for privatization of the system. GLWA has an advisory contract with global water privatizer Veolia. RATES TO RISE FOR WHOLE REGION: Rate increases of 20.1% for Detroit and 11.4% for the suburbs are set for July 1, 2015, if the Detroit City Council approves them June 30. Then, the Authority will set rates “to satisfy the Authority’s Revenue Requirement.” The GLWA will greatly increase DWSD’s debt, to get contracts for cronies of board members from the State of Michigan, Oakland, Macomb and Wayne Counties, and Detroit. Debt payment is priority #1, not improvement of infrastructure, customer service, or water affordability. WATER SHUT-OFFS: The contract continues DWSD’s policy of water shut-offs and may expand it to the whole region. The United Nations has declared water a HUMAN RIGHT. But it may become unaffordable for families in the six counties. The GLWA Water Residential Assistance Program (WRAP) allows shut-offs, and does not base rates on income. TAX FORECLOSURES: The contract will attach water bills unpaid for six months to property taxes, as a “lien” on the home. Though this practice is now limited to Detroit, nothing stops the GLWA from expanding it throughout the six counties. TO WIN OUR CAMPAIGN FOR WATER FOR ALL, WE MUST FIRST DEFEAT THE BIGGER ENEMY, THE GLWA, THEN DEAL WITH DWSD.